Government security services from Signal 88 of Rancho Cucamonga bring peace of mind to government facilities and agencies in the Ontario, CA area. We know that federal, state, and municipal institutions demand a higher level of security than most other facilities. To meet the security challenges faced by your institution, we design custom security solutions, backed by cutting edge technologies, to give you the secure presence and level of protection that your institution needs. Signal 88 of Rancho Cucamonga provides government security solutions throughout the Ontario area. Our services are available to federal, state and municipal institutions in Rancho Cucamonga, Rialto, Fontana, Colton, and the surrounding communities. What sets our government security services apart from our competitors? Our services offer a number of key advantages over those offered by other government security providers in Ontario. Instead of boxing you into pre-set solutions, we build security services around your institution’s needs. Whether you operate a large government facility, manage a smaller government office, or are running a government-hosted event, our security experts will craft a service plan uniquely suited to your security needs and the challenges you face. Signal 88 of Rancho Cucamonga provides both dedicated and roving security options. Dedicated security provides your institution with a consistent onsite presence, while roving patrols offer highly visible vehicle patrols on a randomized schedule. Security plans for government institutions can be customized to include dedicated onsite security, roving patrol security, or a combination of dedicated and mobile security services, depending on your needs and budget. Why Signal 88 of Rancho Cucamonga? Partnering with Signal 88 of Rancho Cucamonga offers a number of further advantages. We offer a level of professionalism, responsiveness, and accountability that distinguishes us from other government security providers in the Ontario area. We’re also the only government security provider in Ontario with 88 Edge® technology, key to the effectiveness and value that characterize our services. 88 Edge is a web/mobile platform that leverages modern technologies into a cutting edge level of protection. 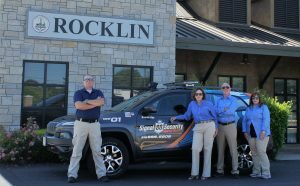 Features like geofencing, digital patrol routing, and cloud scheduling mean we plan our systems and perform our services with a remarkable level of precision. 88 Edge also makes us more responsive, thanks to real-time alerts, digital reports, and remote management of security systems. Learn more about our government security services in Ontario, CA, by calling (877) 522-5588 today.